It's been slightly bizarre to watch controversy swirl around the use of unmanned aerial vehicles in 21st Century war-making, while at the same time UAVs' presence in video games has only grown. Despite the fact that they might be the most politically charged aspect of present-day combat, they've been in multiple Call of Duty games and in Battlefield 3. 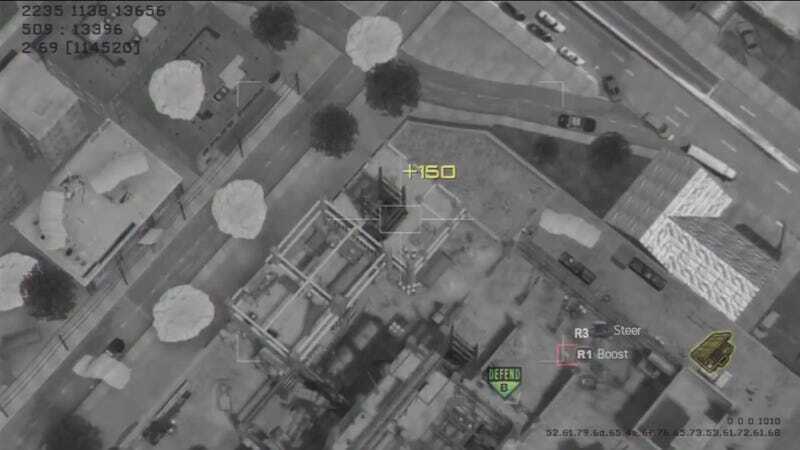 The upcoming Splinter Cell Blacklist will also have unmanned aerial vehicles in it, too. Those opposed to the use of UAVs for taking out targets in hotspots around the world say that it reduces the taking of human life to emotionally distant video game mechanics where button presses take away human lives. "There was good reason for killing the people that I did, and I go through it in my head over and over and over," said Will, an Air Force officer who was a pilot at Creech and now trains others at Holloman. "But you never forget about it. It never just fades away, I don't think - not for me." "I don't have any video games that ask me to sit in one seat for six hours and look at the same target," said Joshua, a sensor operator who worked at Creech for a decade and is now a trainer at Holloman. "One of the things we try to beat into our crews is that this is a real aircraft with a real human component, and whatever decisions you make, good or bad, there's going to be actual consequences." In video games that place you in modern-day war settings, you're usually embodying the role of a soldier savant. One who knows how to drive tanks, bypass security technology and pilot aircraft. In reality, those skills often belong to different classes of soldiers. The servicemen who control drone aircrafts aren't always near the field of combat engagement. That might make them feel very differently about what they do and how they do it. There's already been one very good game about the phenomenon—Molleindustria's Unmanned—and it might be good to see more games delve into the psychological effects of waging war from afar.